Adding code coverage data to NDepend is simple, so do it! Generally, when we first use a new tool, we install it using the default or recommended settings. Then, as we start to use and understand the tool we tweak it. NDepend works brilliantly out of the box and comes into it's own once you learn and tweak it. However, the one thing I would recommend you set up straight away is test coverage data. NDepend doesn't generate the raw data but imports data files from NCover, DotCover and Visual Studio. 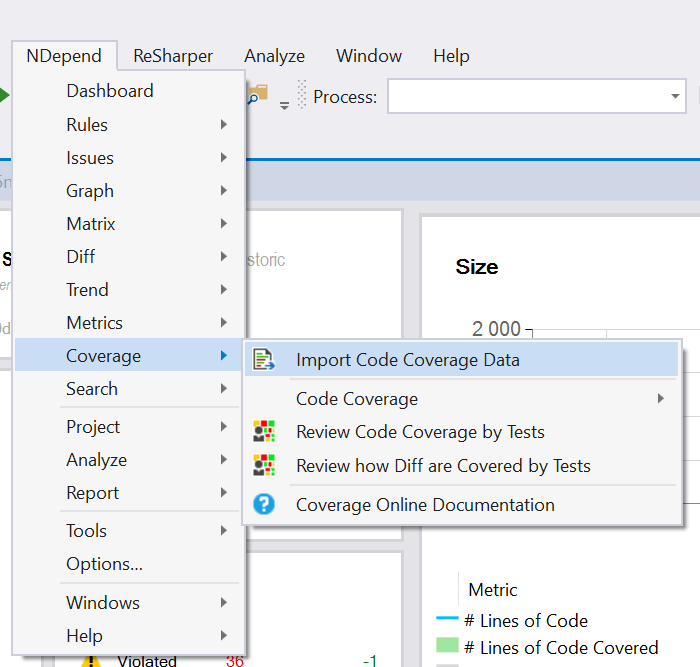 From the top menu in Visual Studio select NDepend -> Coverage -> Import Code Coverage Data to import the XML file. Now if you go to the dashboard you will see coverage data and better technical debt scoring. As you can see adding test coverage data literally takes a few minutes to do. The benefits are; more accurate analysis data from NDepend and a greater understanding of the state of your project. Add to that you can now use CQLinq to query the data and create meaningful rules, there's no reason not to add it!